Info: Ruby and Violet are twin sisters. 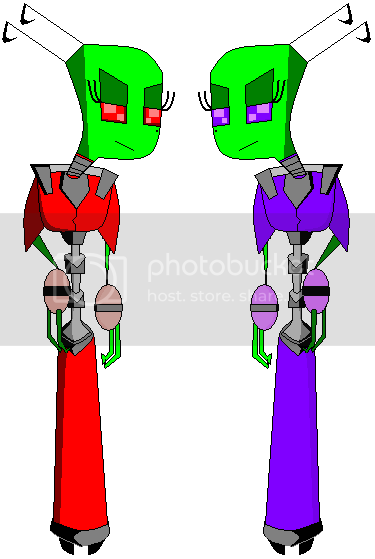 They are also the Tallests, much similar to Red & Purple, but females. They have similar interest like Red & Purple, Ruby with lasers and Violet with smoke machines. The girls idolize Tallest Red & Purple and any boy they have their eyes on. They love to sing. The Sisters are often vain and will try to look good for themselves and their people. They are really nice if they are not busy with their duties. The girls may fight often, but in the end, they get along. Ruby and Violet are also guardians to Chelsea and TIR. Ruby is the wild girl who loves to have fun. Her main focus are her looks and boys. She can be a little tempered, but is happy. Her body is what makes all the boys want her. A stereotypical hot babe with a "wild" side. She is the twin who thinks with her heart. Ruby also loves Tallest Red and any boy that she deems worthy for her. She is a nice girl. Violet is the smart girl who is sometimes quiet. She is a shy Tallest who thinks with her mind. Unlike her sister, she is not interested in what Ruby likes, but can focus on her beauty if necessary. Her shy personality makes her a target for any man to get their hands on her and for that, she is often blushing and then fainted when a guy makes some moves on her. She is often been put down by her sister for ways, but can stand up for herself while trying not to get hit by some laser from Ruby which happens a lot. Like her twin, she is also nice and can open up her heart to anyone. It is not recomended but a picture reference is highly acceptable, if you might have one. The link has the picture, just needs to open up a new window, I'm not sure how to do a code thing here....or do you mean something different. Sorry if I don't understand it. Nvm. The link works now. By the way, just put [ img] <insert link here> [/img] around your links, and the picture shows up.